Mr Nice Seeds - Neville's Haze. Free US delivery. A tribute to the father of all modern seed companies, Neville Schoenmakers. There is something very special about this 3/4 sativa that those in the know will recognize once they smell the end product. 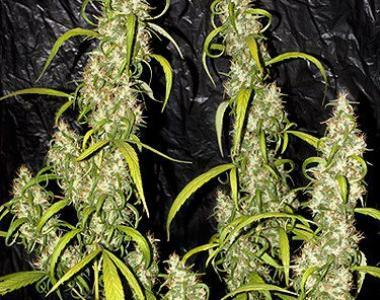 It can be difficult to know what to base your selective reasoning on, but the plants that go longer than 16 weeks indoor will really not be of value in the end to indoor cultivators. A tip for those who do find a long flowering plant they wish to keep...clones usually finish 2-3 weeks quicker than the seed mother plant and therefore will give the grower a possibility to finish something that normally needs the tropics to grow in. The full flavor is sativa all the way so for you Indica lovers this plant will not be for you! It was made by combining a pure Haze to a NL5/Haze, thus creating probably one of the most influential plants of our time , certainly for flavor , aroma and effect. All seed companies owe the ground work and origin of modern cultivars to Nevil . Like the man himself...the legend grows! All product information is provided 'as is', for informational and educational purposes only. The information is obtained from seedbanks and breeders and we cannot gurantee its accuracy. Please Note: These seeds are sold as souvenirs only. We accept no liability for customers purchasing them for any other purpose. Customers are advised that under UK law it is illegal to germinate cannabis seeds without a licence from the Home Office. Disclaimer: Under section 9A of the missuse of drugs act 1971, it is an offence to supply or offer to supply any article which may be used or adapted to be used for taking illegal drugs, believing that the article will be used in such a way. None of these products are sold for the purpose of drug taking, preparation, or cultivation and any discussion that leads us to believe they will be will result in refusal of goods. You may need to confirm your email address first if you haven't already done so. One newsletter each month with discount codes, free seed offers and info on new strains. No spam ever. That's a promise. You're just one step away from awesomeness! If this is the first time you've made contact, you will soon receive a confirmation email to the address you entered. Simply click the link to confirm it's you and your newsletter will arrive at the start of next month. I am age 18 or older and I am aware that this website provides cannabis related content / products. I live in a country where it is legal to view information about cannabis. I will not use the information provided on this website for any illegal activities. I agree to allow cookies from this web-site to be saved on my computer. We've noticed that you're visiting from a country outside of the United Kingdom where we're based. To change the default currency for prices to $USD, Euros or $AUD click on the appropriate flag in the top left of your screen. If you using a mobile or tablet, then you need to show the menu first by clicking the three bars at the top left of your device's screen. Please remember, due to UK Law we're unable to discuss anything related to the germination or growing of seeds. Disclaimer: Any pictures shown of plants are for indicative purposes only. This site only supplies seeds for souvenir purposes and does not supply plants or plant material. Under section 9A of the missuse of drugs act 1971, it is an offence to supply or offer to supply any article which may be used or adapted to be used for taking illegal drugs, believing that the article will be used in such a way. None of these products are sold for the purpose of drug taking, preparation, or cultivation and any discussion that leads us to believe they will be will result in refusal of goods or termination of your order. Sign up to our newsletter and instantly receive a 10% discount code. Be the first to know about discounts, limited promotions and other news! Close and don't show me this annoying popup again! !